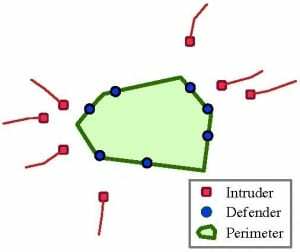 A recent paper by members of the DCIST alliance studies the perimeter-defense problem in which a defensive team protects a region by intercepting intruders before they can reach it. By exploiting the geometry of the problem the paper discusses the benefit of cooperation among the defenders and proposes a decomposition method to simplify the analysis of the challenging multi-player differential game. The next steps in this work are to incorporate detection and communication aspects and to address policies for teams with heterogeneous capabilities.